Approximate address was 1501 E 103rd, or here, so you are correct the bus was turning into the southbound ramp. I figured that the ABC7 story was wrong, in that Woodlawn doesn't even go south there. Obviously it was a 353 doing as what you said. Woodlawn does go south from 103rd. It turns into Doty Av, which is the frontage road along the Bishop Ford that goes to Walmart. But we are in agreement that the accident didn’t happen there. Most likely scenario is Pace driver underestimated how fast CTA was going and how fast his bus could accelerate from a stop, CTA driver did not expect Pace to turn in front of him. Unless the Pace bus was in reverse and the driver was not using the backup cam, the usual presumption is that if you are rear ended, the other driver is at fault. Pace driver was supposed to take the turn onto the ramp at 53 mph? The bus wasn't "rear ended" in the usual sense. They were traveling opposite directions when the Pace bus turned across the path of the CTA bus, and the impact was to the rear of the Pace bus as it was nearing the end of its turn. There could easily have been a dispute over whether Pace turned unsafely or CTA ran the red light, which might explain why no citations were issued. The crash report has the primary cause listed as "UNABLE TO DETERMINE". There's not enough information for us to determine who was at fault. The bus wasn't "rear ended" in the usual sense. 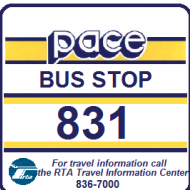 They were traveling opposite directions when the Pace bus turned across the path of the CTA bus, and the impact was to the rear of the Pace bus at the end of the turn. 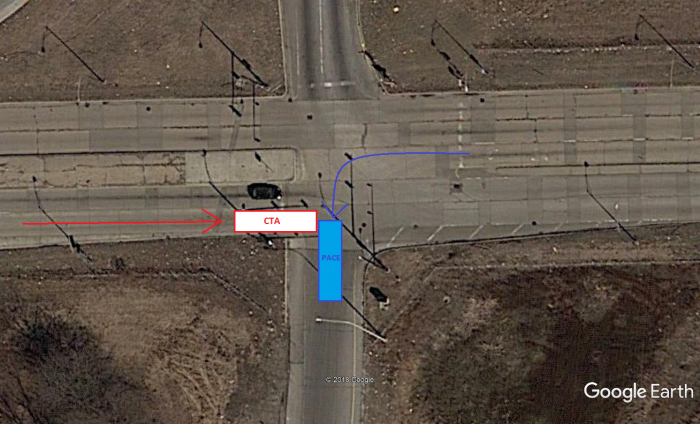 There could easily have been a dispute over whether Pace turned unsafely or CTA ran the red light, which might explain why no citations were issued. The crash report has the primary cause listed as "UNABLE TO DETERMINE". There's not enough information for us to determine who was at fault. Like I said earlier, the dashcam could tell us, not that the agencies would divulge anything. I would expect both agencies to be sued in court for unsafe actions contributing to this accident. So your saying the #353 does a 180 there? If it did a 90 it would have side impact damage. Regardless the bus was rear ended and will be viewed as the fault of the striker. The CTA bus was obviously driving too fast for conditions if the road was slick it's still the strikers fault. No citations were probably not issued due to blaming road conditions. The crash report has the primary cause listed as "UNABLE TO DETERMINE". That's because the police report is inadmissible hearsay if the cop was not there at the moment of the collision. It only provides proof that the accident was reported and forms for reporting it to the Secretary of State. You're putting too much into it. I would expect both agencies to be sued in court for unsafe actions contributing to this accident. If you mean by the passengers, sure, as the lawyers will join anyone potentially liable. There probably will be an intergovernmental agreement between CTA and Pace settling the property damage, again not including an admission of liability. A rear end accident is when some hits another vehicle in the rear end. What happened here was a t - bone, although it was toward the rear of the bus, it was still a SIDE impact, not a rear end. This is why no citation was issued. CTA could possibly charge their driver with a preventable accident which means the driver didn't do something(s) that could prevented the accident from happening. Pace probably will charge their driver with a preventable accident. Most companies will fire you for 3 preventable accidents in a twelve month period. However., when there's major damage, injuries, or fatalities involved, a company or agency can move fire a person based only on that accident. Some even fire drivers for one thing minor preventable if the driver is in a probationary period . The part you quoted wasn't intended to prove anything in the previous sentences, it was only to show that those of us on this forum aren't able to tell who is at fault. The officer(s) on scene couldn't easily tell what the primary cause was, so we can't either. If this is the correct representation of what happened, the ABC7 statement that the buses were operating in opposite directions at the time of the collision was somewhere between mortadella and doktorskaya.